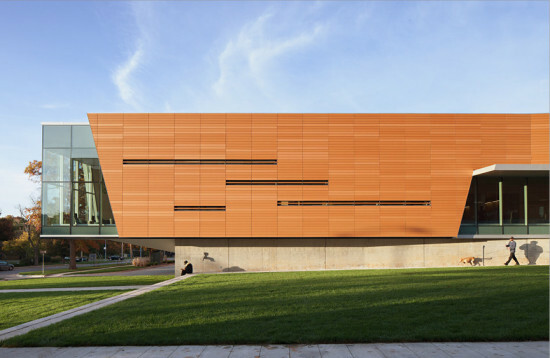 Terra cotta rain screen transforms brutalist eyesore into energy-efficient community space. Considered an aesthetic and functional failure almost since its construction in 1974, the old public library in Lawrence, Kansas, was overdue for a renovation four decades later. Gould Evans‘ challenge was to transform the low-slung brutalist behemoth, a poor environmental performer lacking both adequate daylighting and a sense of connection to the community, into an asset. “The desire was to try to come up with a building that basically reinvented the library for the community,” said vice president Sean Zaudke. Rather than tacking an addition on to one end of the existing structure, the architects elected to wrap a 20,000-square-foot reading room and open stacks area around the old facade. In so doing, they altered the exterior for the better, swapping bare concrete for an earth-hued terra cotta rain screen punctuated by plentiful glazing. 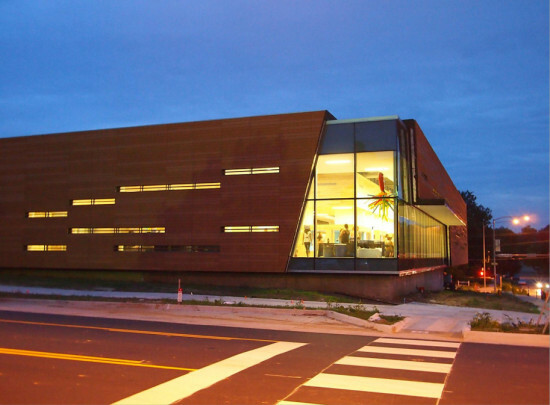 They also significantly enhanced the library’s environmental performance, with early estimates suggesting that the new Lawrence Public Library will see a 50 percent reduction in energy usage despite a 50 percent increase in square footage. Daylighting was another of the architects’ key concerns. “Because there were so few windows in the old library, wherever you went there was a sort of phototropic behavior,” said Zaudke. “People just gathered around the windows. 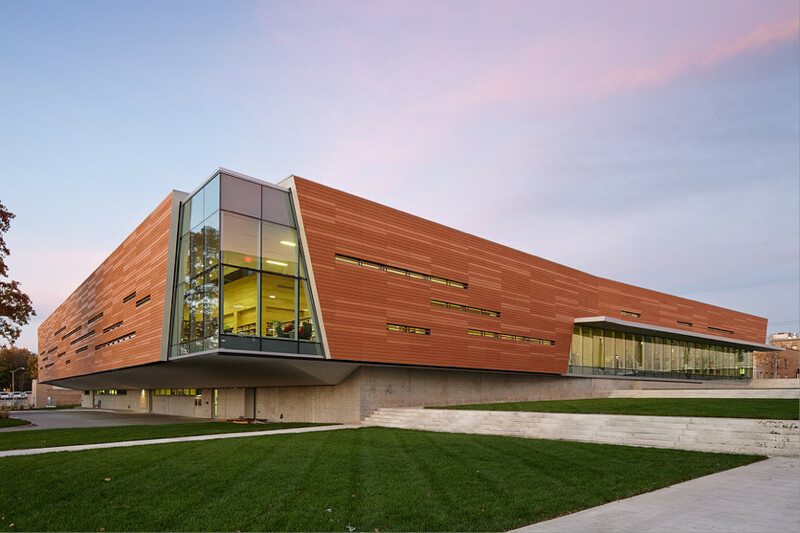 The rest was not as utilized.” Gould Evans significantly altered the user experience by creating an open reading room within the wraparound addition, all of which is exposed to daylight. Other library functions are contained within the core, which in turn is lit both by a continuous clerestory and a series of Solatubes. The clerestory also prevents glare within the reading room by illuminating the inside of the facade. Gould Evans used prescriptive data to determine the overall balance of terra cotta to glass on the new facade—about 60/40—as well as on each exterior wall. To reduce thermal gain on the east and west faces, the architects placed terra cotta baguettes over each horizontal slit window. Together, the baguettes and the depth of the wall act as sunshades.